Did Queen Victoria Marry John Brown? I know this is not from our period, but I thought you might find it interesting. The news of 1866 carried a piece in the Gazette de Lausanne, a Swiss paper, that read, “On dit…that with Brown and by him she consoles herself for Prince Albert, and they go even further. They add that she is in an interesting condition, and that if she was not present for the Volunteers Review, and at the inauguration of the monument to Prince Albert, it was only in order to hide her pregnancy. I hasten to add that the Queen has been morganatically married to her attendant for a long time, which diminishes the gravity of the thing.” Most assuredly, no British paper carried such a tale, but once the word spread of the Queen’s supposed affair, there was no reining it back in. So exactly who was John Brown and how did he come to Queen Victoria’s notice? Brown was from Crathienaird, Crathie parish in Aberdeenshire. He was the second of 11 children of a tenant farmer John Brown and his wife Margaret Leys. He was educated at the local school and at age 13, he began work as a farm laborer and as an ostler’s assistant at Pannanich Wells. Later, he became a stable boy at Sir Robert Gordon’s estate at Balmoral and was on the staff when Queen Victoria and Prince Albert visited Balmoral for the first time in September 1848. Queen Victoria’s journal holds a mention of John Brown for the first time in 1849. Brown was promoted to gillie, in Scotland, means a man or boy who attends someone on a hunting or fishing expedition. The royal family had visited Dhu Loch. Brown was close to both the Queen and Prince Albert over the years. By 1858, Brown was Prince Albert’s personal gillie. He served Albert until the prince’s death in December 1861. He was a staple of the royal family’s time at Balmoral. In 1864, Princess Alice, the Queen’s third child and Royal Physician Dr William Jenner and the Keeper of the Privy Purse Sir Charles Phipps took it upon themselves to bring Brown up to the Isle of Wight from Balmoral to aid the Queen in overcoming her depression after Albert’s death. They thought that Brown would remind Victoria of happier times. In December 1864, Brown arrived at Osborne House as a groom. Unsurprisingly, Brown’s brusque manner did the trick. Soon Victoria was riding daily. When the queen rheumatism bothered her too much to sit a horse, Brown took her out on a pony cart. She relished the manner in which he paid her strict attention. By 1865, Brown had become a permanent member of the Queen’s staff. 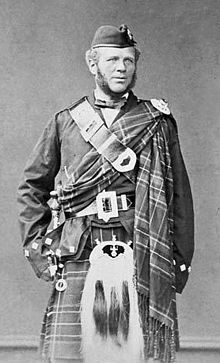 He was given the title of “The Queen’s Highland Servant.” Over the years, he was awarded both the “Faithful Servant Medal” and the “Devoted Servant Medal.” His salary rose from £150 per annum to £400 (in 1872). It was Alexander Robertson’s pamphlet “John Brown: A Correspondence with the Lord Chancellor, Regarding a Charge of Fraud and Embezzlement Preferred Against His Grace the Duke of Atholl K. T. of 1873” that first openly suggested that Queen Victoria and John Brown had married morganatically [relating to, or being a marriage between a member of a royal or noble family and a person of inferior rank in which the rank of the inferior partner remains unchanged and the children of the marriage do not succeed to the titles, fiefs, or entailed property of the parent of higher rank]. There are other theories regarding the Queen’s relationship with John Brown. Some think that he served as her “keeper,” after all he was brought to Osborne House to “keep” Victoria from her extreme bouts of melancholy. Some went as far as to think her as “mad” as her grandfather, George III. Lamont-Brown (21 -23) tells us, “With Brown being a Highlander it was presumed that he had the phenomenon known as taibhseadaireachd the ‘Second Sight’ with all its psychic attributes. As Queen Victoria was obsessed with the morbid memory of Prince Albert, it was easy for gossips to conclude that the ‘psychic’ John Brown was her spiritualistic medium. All of these elements of gossip had deep roots and there were many willing to exploit them. 14 Responses to Did Queen Victoria Marry John Brown? very interesting .Haven’t seen either movie and have little interest in the subject. However, I don’t think she married Brown. She was too aware of her position and hated pregnancy. Her uncle the Duke of Sussex had his marriage to lady Augusta Murray declared invalid and his two children illegitimate. After Lady Augusta died, the duke married another woman with out gaining permission from the Queen. Victoria allowed the marriage to stand as a morganic marriage and even gave the wife a title of her own. You do have interesting blogs. I loved the film Mrs. Brown, although I don’t recall thinking it was ever more than platonic. It was evident that she found comfort in his company. I’ll have to check out Victoria and Abdul. Great post, Regina! Didn’t two of her uncles enter into morganatic marriages? (Or was that just one uncle, twice? So although I doubt she did marry Brown, it’s not entirely out of the realm of possibility, since there was precedent within her close family. There was Prince Leopold, who married Princess Charlotte, the only daughter of George IV (the Prince Regent in Austen’s time). Had Charlotte survived, she would have become queen of the United Kingdom on the death of her father and Leopold presumably would have assumed the role of prince consort, later taken by his nephew Prince Albert of Saxe-Coburg and Gotha. Despite Charlotte’s death, the Prince Regent granted Prince Leopold the British style of Royal Highness by Order in Council on 6 April 1818. From 1828 to 1829, Leopold had a several-months long affair with the actress Caroline Bauer, who bore a striking resemblance to Charlotte. Caroline was a cousin of his advisor Christian Friedrich Freiherr von Stockmar. She came to England with her mother and took up residence at Longwood House, a few miles from Claremont House. But, by mid-1829, the liaison was over, and the actress and her mother returned to Berlin. Many years later, in memoirs published after her death, she declared that she and Leopold had engaged in a morganatic marriage and that he had bestowed upon her the title of Countess Montgomery. He would have broken this marriage when the possibility arose that he could become King of Greece. The son of Freiherr von Stockmar denied that these events ever happened, and indeed no records have been found of a civil or religious marriage with the actress. Then there is Maria Anne Fitzherbert, who was a longtime companion of the future King George IV of the United Kingdom with whom she secretly contracted a marriage that was invalid under English civil law before his accession to the throne. Though Fitzherbert had been disinherited by her first husband, her nephew-in-law (Cardinal Weld) persuaded Pope Pius VII to declare the marriage sacramentally valid. The twice widowed Fitzherbert soon entered London high society. In spring, 1784, she was introduced to a youthful admirer: George, Prince of Wales, six years her junior. The prince became infatuated with her and pursued her endlessly until she agreed to marry him. Secretly, and – as both parties were well aware – against the law, they went through a form of marriage on 15 December 1785, in the drawing room of her house in Park Street, London. Her uncle, Henry Errington, and her brother, Jack Smythe, were the witnesses. This invalid marriage ceremony was performed by one of the prince’s Chaplains in Ordinary, the Reverend Robert Burt, whose debts (of £500) were paid by the prince to release him from the Fleet Prison. Actually the marriage of The prince of Wales and Mrs. Fitzherbert was technically valid. They had a special license and a clergyman officiated. Like his brotherAugustus’s marriage, however, the marriage was against the Royal Marriage Act and was thus invalid. If the marriage hadn’t been invalid because of the Royal marriage act, The Prince could have lost his place in the line of succession for violating the settlement of 1707 and 1715 that said no one in the line of succession could marry a Catholic. Mrs. Fitzherbert considered herself legally married . She was not Haymarket ware and would’t have become the prince’s mistress . She considered them married, he didn’t. As to Victoria and John Brown– people love to think up scandalous stories. I don’t think she would so lower her dignity.. It is fun to speculate, but, like you, I doubt Queen Victoria would succumb to an affair. Any woman who religiously placed out her late husband’s clothing each night was not likely to disrespect his memory during the day. Victoria and Abdul was well worth seeing! Wonderful movie! Mrs. Brown is good too. Nobody does it like Dame Judi! I never knew about Abdul ,an interesting relationship they had! Yes, it makes one wonder about the Queen’s stability at that time. This was fascinating! I never heard about John Brown before. I’d be interested in knowing more of what you thought of the movie about Victoria and Abdul. Is it worth seeing? The movie is definitely worth seeing. It is well done by all involved. The cinematography was excellent in its story telling. I do not know whether the acting was better in Mrs. Brown or whether the idea of another movie where Queen Victoria has an “unusual” relationship years after Albert’s death appeared old hat. Perhaps if someone other than Judi Dench played Victoria in Victoria and Abdul (V & A, get the connection) it might have come off as a fresh idea. It’s been many years since I saw Mrs. Brown but I remember enjoying it very much. I do not believe there was a marriage or child. I believe they were very close friends but that it was a platonic relationship. I am very much in the same corner. Victoria’s personality was not an easy one. Combine that with her position in the world, I imagine she was quite lonely. How interesting. I have seen the movie Mrs. Brown. I love Judi Dench. I did not know of Victoria and Abdul. I will have to check that out. Thanks for this informative bit of history. You are more than welcome, Ma’am. I liked Victoria and Abdul, but I could not get Mrs. Brown out of my head.